Rotary Airlock Valves increase uptime for general processing. ASC cast iron rotary airlock valves feature ACS RotorRail™, whichÂ enables tool-less access to rotor and all internal surfaces of housing without disassembly of rotor or removal from service of upstream or downstream equipment. Also, ACS RotorRail™ ensures accurate rotor re-alignment during re-assembly. Cast iron housings are CNC-machined to precise tolerances, and optimal inlet/outlet seal produced is achieved using 8-vane rotor design. Sizes range from 6–16 in. CALEDONIA, Ontario, Canada – ACS Valves. ACS Valves introduces a new line of cast iron rotary airlock valves designed to provide to general industry the same primary process optimization benefits typically associated with high-end, specialty-application valve designs. 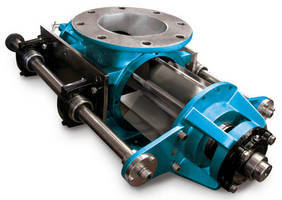 This new line of ACS cast iron rotary airlock valves features the ACS RotorRail™ that enables tool-less access to the rotor and all internal surfaces of the housing without time-consuming disassembly of the rotor, or the removal from service of upstream or downstream equipment commonly associated with standard valve configurations. The ASC cast iron rotary airlock valve with RotorRail™ has shown, when compared to bolt-together housing designs, to reduce rotor service cycle times by 78%; and, as a result, increase total process uptime by 18% during a typical 8-hour operating shift. The ACS RotorRail™ feature of these cast iron valves also ensures accurate rotor re-alignment during re-assembly; thus, eliminating axial shaft movement, bearing wear and seal leakage, and premature, uneven rotor vane wear. The cast iron housings of these ACS rotary valves are cast in North America, and are CNC-machined to precise tolerances. The optimal inlet/outlet seal produced by these ACS rotary airlock valves is achieved using the standard, ACS Valves, 8-vane rotor design. The ACS Valves 8-vane rotor design eliminates excess pressure loss through the system, ensures cost-efficient upstream and downstream material management, and reduces process energy consumption. These ACS rotary airlock valves are available in sizes from 6 inches to 16 inches, with pressure differentials up to 15 PSIG, and temperature tolerance up to 500ºF. Rotor configurations include: closed-end, metering, shallow-pocket, Teflon®-coated, and adjustable-tip. Adjustable rotor tips are available in stainless steel, hardened steel, or bronze. Interior surface coating options include: hard chrome and Teflon®.